This past weekend was so much fun! My program had an organized trip to many little places around Tuscany that me and my roommates went on. It was just Saturday to Sunday so we had the beginning of the weekend to relax and just hangout. Friday night we made dinner at home and watched She’s the Man, which none of us had seen in forever and quickly remembered how hysterical it is! What happened to Amanda Bynes, she’s crazyyyy now! The trip left early Saturday morning for Siena. It is a small town and we learned a lot about Catherine of Siena during the tour. There is a beautiful church set up on a big hill that is basically the biggest thing in the town. We finished the tour at a large piazza where we then ate lunch – single slices of pizza! This was the first time all semester that we’ve just been able to eat a slice and it was so nice and a little reminder of home. The slices were huge by the way – like 1/4 of a pie! We ate our slices in the piazza and layed in the sun. I actually fell asleep for a couple minutes just sunbathing. It was nice and relaxing and fun to see a new part of Italy that is so different than Florence yet so close! 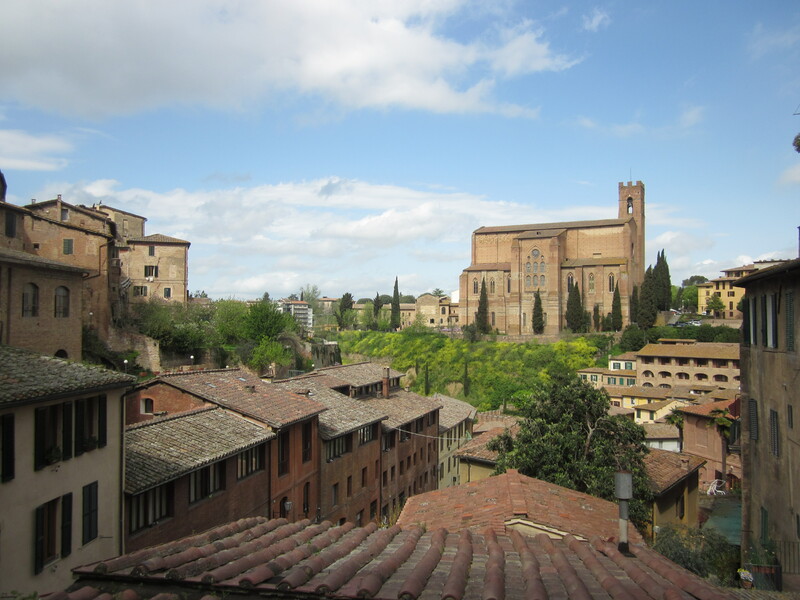 From Siena we headed to thermal baths in Rapolano. They were just like those in Budapest but a little smaller and there were more outside. Even though it was a Saturday the spa wasn’t that crowded because it is starting to get warmer and people are heading to the coast! Yes it was around 70 degrees outside but the thermal pools were still amazing to be in…not too cold or too hot! We lounged in the water for a couple of hours before leaving for the hotel. The API ladies had told us they were giving us dinner at the hotel but everyone was kind of like ya ya ok sure because every time we’ve had an organized “dinner” with the group its been just an appertivo buffet that is over crowded and not enough food. However, at 8pm we went to the lobby to check it out and there were set tables. So we sat down and were immediately greeted by a woman spooning pasta in our dishes. Amazing! The pasta was delicious and not even a small portion and my table got seconds! I was so satisfied I didn’t even need anything else, but then came the chicken and potatoes, then salad (the Italians have weird timing with their salads) and then chocolate cake dessert! I was so full it was beautiful. After dinner we all walked into town to this bar that was inside and outside and there was live music under the bridge we were on so that was nice. It was a great ending to a great day and I was excited for the next day! Sunday we woke up and left for Cortona – where the movie Under the Tuscan Sun was filmed!!!! If you’ve seen the movie (and if you haven’t you must) I don’t need to explain the beauty of the town. The busses dropped us off at the bottom of a huge hill, where Cortona is located, and we had to take little vans up to town because there was a rare car race going on through town. Of course we had a tour and then got to stop and see some of the antique cars. They were antique racecars though, not like the ones you see in parades, and it was exciting to watch them race around the windy roads. 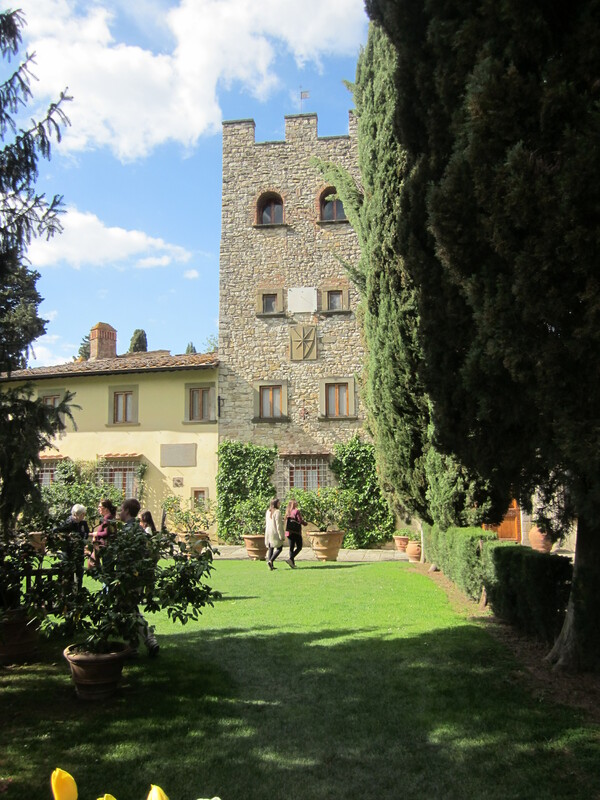 After Cortona we went to Castello da Verrazzano for a wine tasting. At this point we were all very tired and a little cranky because they told us it was going to be a short bus ride and it was 2 hours long. Getting off the bus there was a lot of complaining but as soon as we made our way to the Castle gardens everyone shut up. It was absolutely gorgeous filled with lemon trees and fountains and a nice old British lady gave us some history about the castle and the Verrazzano family. We went on a quick tour of the wine cellar then were seated in a grand terrace for the tasting. We tasted 4 wines – 1 white, 2 red, 1 dessert (ew) and had lots of appertivo to go along with it. Prosciutto, salami, bruschetta, olive oil, quiche, biscotti, salad and olives were just a few of the things that were passed around our table. We drank and ate for about an hour and had so much fun meeting the 5 other girls that sat at the table with me, Bre and Michelle. They were all so nice and all from different places and I’m sad I didn’t get to meet them earlier in the trip 😦 The wine tasting was definitely my favorite part of the trip! 1) I somehow managed to get allergies for the first time in my 20 years of existence! As soon as we got on the bus Saturday morning it was like flipping a switch – my nose was uncontrollably running, eyes water, I couldn’t stop sneezing (and I have obnoxious sneezes) and my throat was sore. It was awful. I barely slept Saturday night because I kept having to wake up to blow my nose. Thankfully it didn’t ruin my weekend and I stil managed to have a ton of fun! 2) I forgot I needed to charge my camera battery. So when I turned on my camera in Siena it started to die so I knew I couldn’t take my pictures. So I basically could only take like 1 picture at every place. This entry was posted in Life in Italy, Travel and tagged abroad, catherine, cortona, europe, italy, siena, thermal baths, tuscany, wine. Bookmark the permalink.